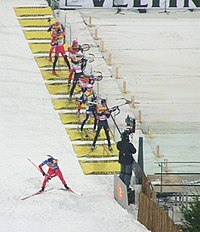 Biathlon is ony sportin event made up o twa disciplines. However, biathlon uisually refers specifically tae the winter sport that combines cross-kintra skiin an rifle shuitin. Ither popular variants include simmer biathlon, which combines cross-kintra rinnin wi rifle, an biathle (an aa kent as "modern biathlon"), which combines rinnin wi soummin. This page wis last eeditit on 13 Februar 2018, at 08:17.